When we first started dreaming about the set up of our homestead, we knew we wanted a shared barnyard situation in which the livestock all lived together in the same barnyard area during the day, and then went into their separate stalls and pens indoors at night. We felt this was an easier and less expensive set-up to build when you are restricted by space and terrain (we have 3 acres on a mountainside). So the plan was to build a barn, with an attached chicken coop, and then attach the barnyard fence in a way that all the animals can get outside into the same yard. You can somewhat see our set up in this picture from 2013…we have the barn with two stall doors, and the coop is the smaller attachment on the left in the photo, and it all opens into one big barnyard. There are several benefits to this set-up, but with this post I am focusing on the benefits to the chickens, and the garden. We all know the benefits of free-ranging chickens – healthier eggs, lower feed costs, and more space for the birds which helps their health and quality of life. But there are also drawbacks, mainly – predators and having chickens wander where you don’t want them, such as in the garden, or on the front porch leaving droppings. And we all know the amazing benefits of having good compost in the garden beds. Our garden can definitely attest to it, as we averaged a pound of produce per square foot of gardening space in our garden this year – and that is grown on a short season (10-12 growing weeks), cold climate (down to 40F throughout the summer nights), high-altitude (7,500 ft) garden – all things which limit a garden’s productivity, BUT it is filled with our own barnyard-made compost. 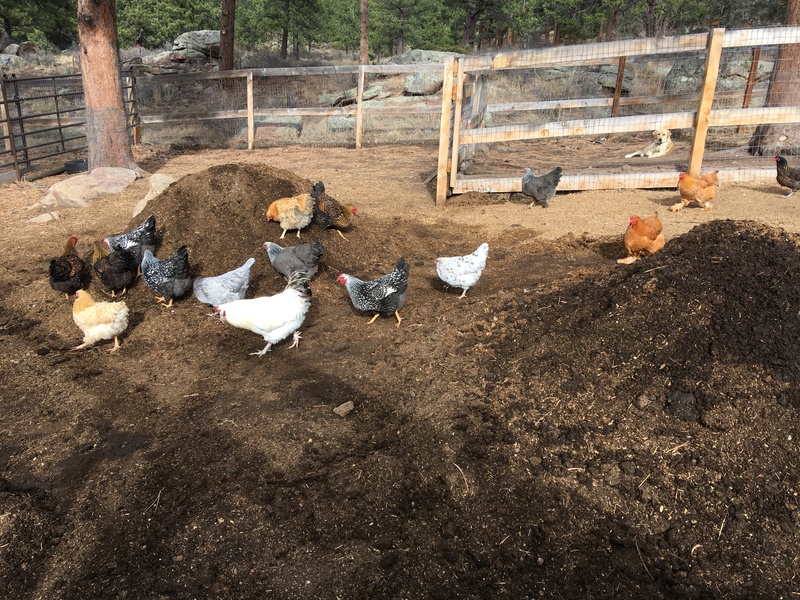 The shared barnyard method, which also incorporates a compost pile into the barnyard that the chickens have access to, is the key to both removing the downfalls of free-ranging chickens, and to creating amazing garden compost in a shorter period of time. By keeping the chickens in the enclosed barnyard area they are much safer from predators. 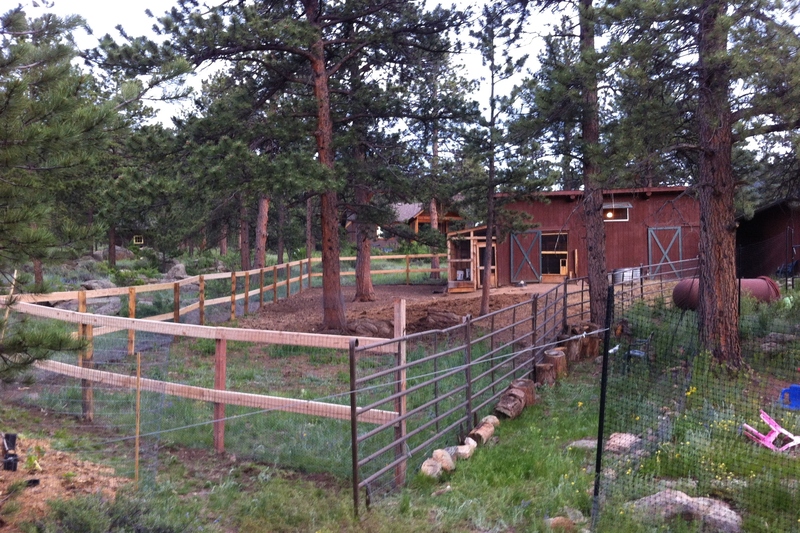 Good fencing not only keeps the chickens in, but keeps the predators out. It limits their risk to only predators that can jump the fence, or aerial predators. But with all the human smells and activity, those are even limited to only the ones that are bold enough and hungry enough. 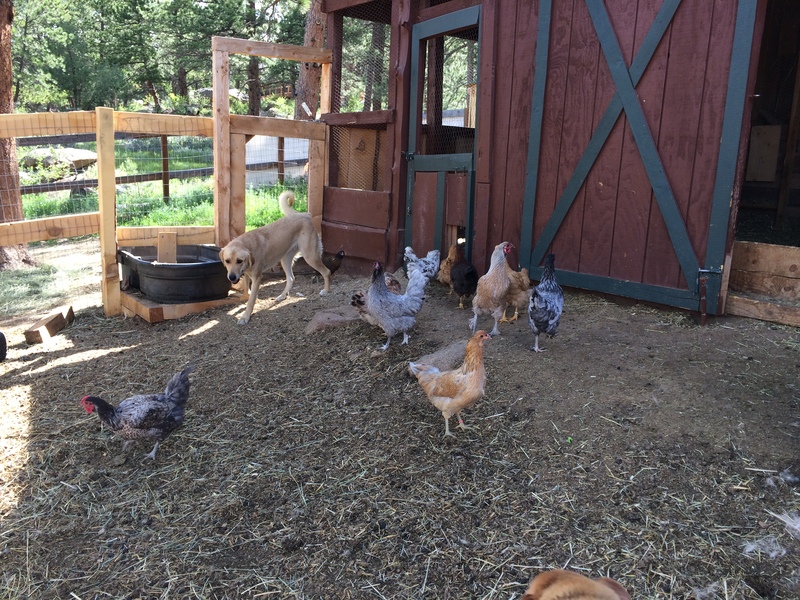 And in our barnyard, the Livestock Guardian Dog keeps even those out, so our chickens are safe from predation. 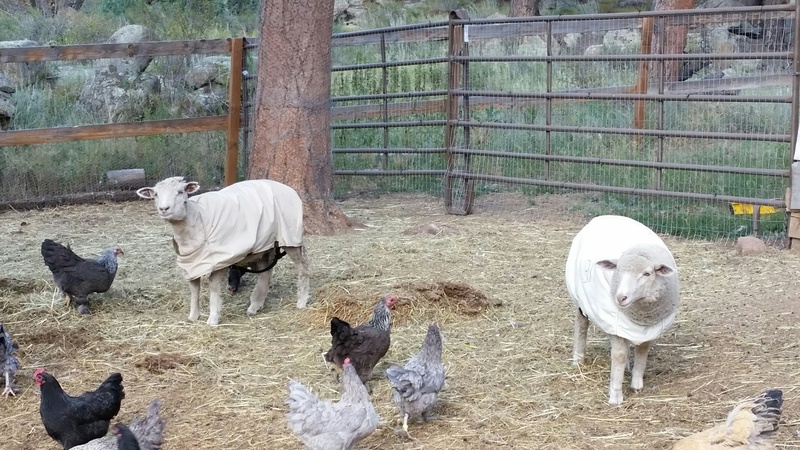 Keeping them in the shared barnyard also keeps them away from places we don’t want them to be, like the garden or front porch, while still giving them the opportunity to free-range. The shared livestock barnyard is full of great things for the chickens to forage and eat. 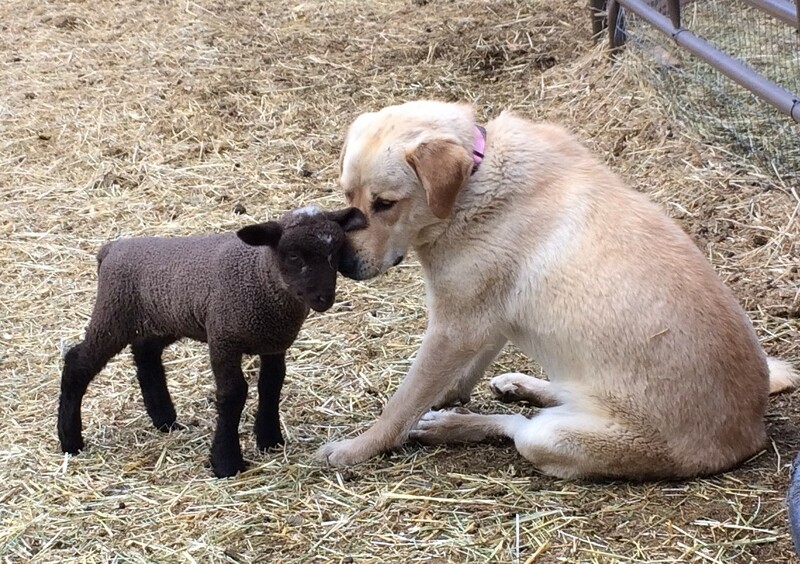 They can scratch through the droppings from the other livestock, as well as the leftover hay and feed scraps, to find all sorts of bugs and seeds and forage – all of which would just be wasted if they were not in the shared barnyard. In addition, we dump our compost pile right in the middle of the barnyard. It consists of all the kitchen and garden scraps, as well as everything we clean out of the barn stalls and coops when we clean them. So it has a big mix of food and garden scraps, hay, straw, pine shavings, and plenty of poop from all different breeds of livestock. We put it in one big pile in the middle of the barnyard (not near the fence lest it be used as a way to climb out). The chickens then are able to scratch through it all, finding all sorts of things to eat, and turning and aerating the compost for us at the same time. Because the chickens are doing all the hard work for us, our compost maintenance consists of adding stuff to the pile as we have it, and then every few weeks going out and raking the pile back up into a pile since it has been spread out by the chickens. We then rake it back into a pile, which is stirring and turning it even more, and we continue adding to it. Usually we start with one pile higher in the barnyard, closer to the barn so it is easy to clean the stalls out into it. That is the less-composted pile. Then, as it begins to turn more and more into soil we move it down to a second pile lower, and start adding the fresh stuff to a new upper pile. Then, come spring it is time to “harvest” the black gold. 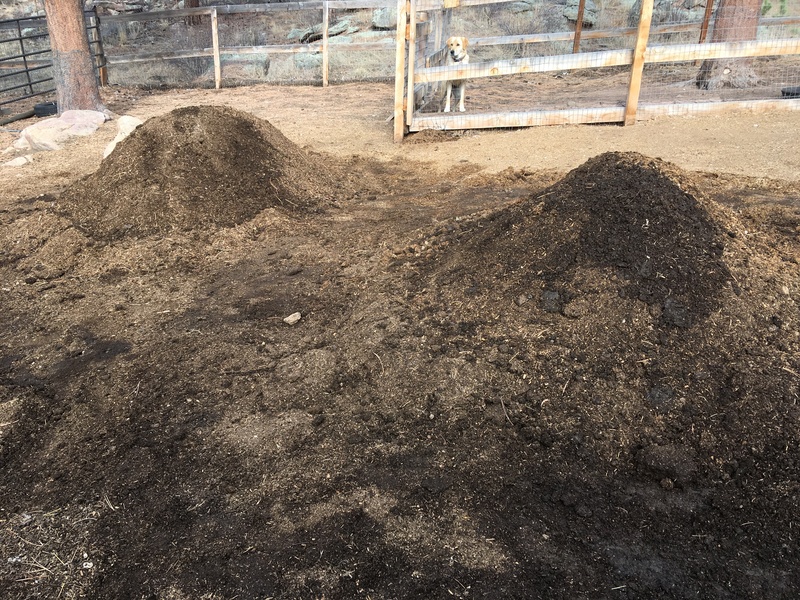 We take a wheelbarrow (or a tractor, when we have access to one) into the barnyard and scoop up the compost that is finished and take it to our garden. And the cycle continues. Other gardeners in our area have told us that because of the cold climate it takes them approximately 2 years to get their compost to the point it can go into the garden. They are using compost bins that they manage and turn on their own, and their compost is mainly kitchen and garden scraps. Here at our homestead we have easily had plenty of compost each spring to fill our garden after only a year of time for it to breakdown. Some years we have had so much that we were able to share it and give it away to other gardeners as well. 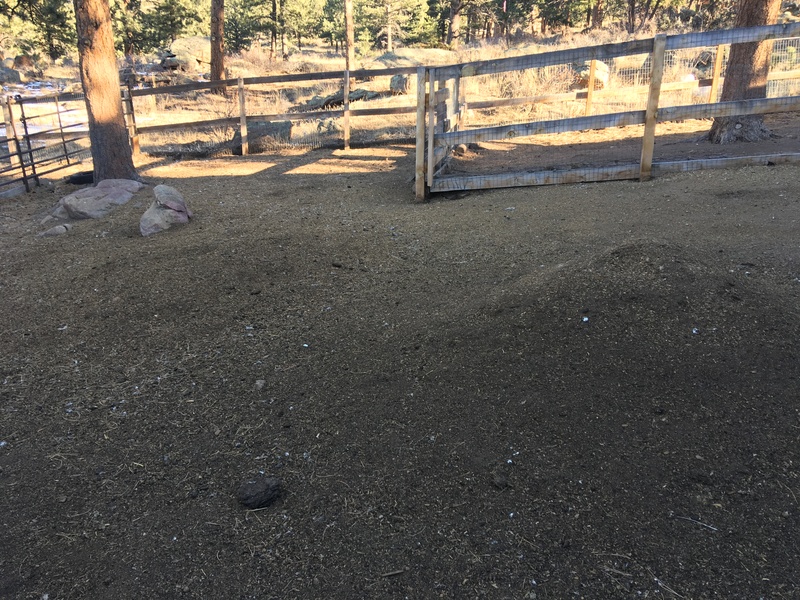 And because we do the shared barnyard method it includes all the poop, bedding and feed scraps left from the animals, thus being a more balanced compost. And it composts faster because we let the chickens work on it, which speeds up the breakdown, and leaves us with rich black gold to use, all the while feeding the chickens and cutting our chicken feed costs. 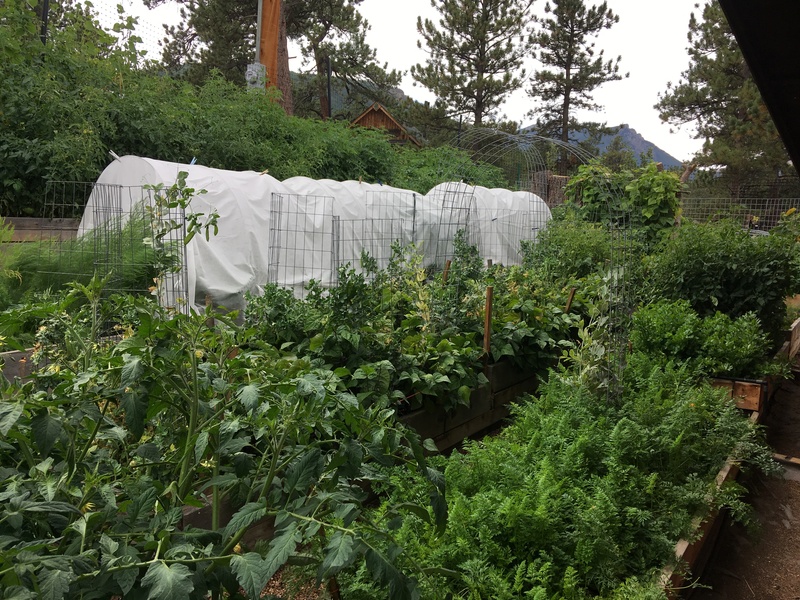 Over the last 6 1/2 years we have found the shared barnyard method, with a compost heap in the middle of it, to be a super-efficient way to manage our little backyard homestead. It benefits each of the different types of livestock, especially the chickens, and makes for a super-productive garden as well. This entry was posted in Chickens, Gardening. Bookmark the permalink. Do you follow Justin Rhodes on YouTube? If not I feel like you would like his ideas. I don’t use youtube much, but I’ll go see what he has there. Thanks! It’s my Saturday morning treat for working my 9-5 Mon-Fri. I catch up on his videos and learn more about what I want to be doing. We let our chickens do the composting for us, too! It’s so much easier, I don’t know why more people don’t! You always have great tips. I will have to share this latter with my husband. We are trying to grow tomatoes now but here in Arizona it can be a challenge, especially where we are, which is the desert. Your photos are adorable…love the dog. How big of a community area do you have and how many animals share it? 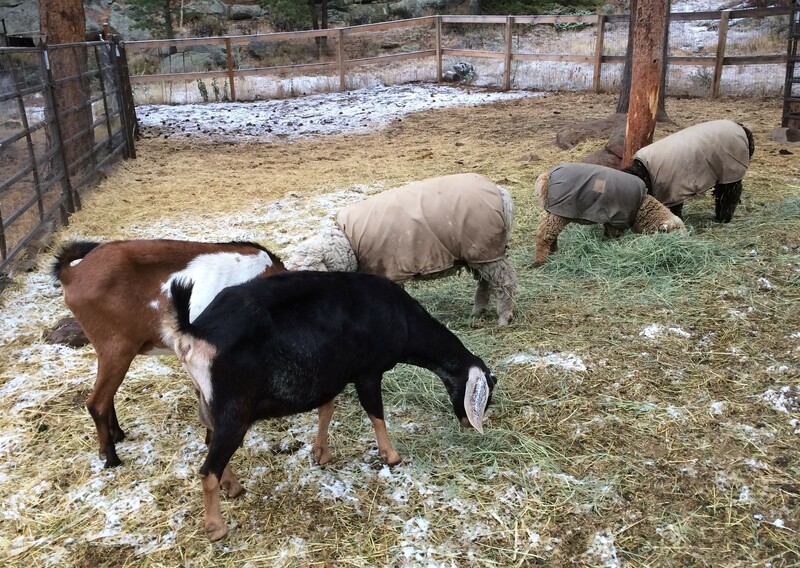 Do you have to worry about your goats or sheep eating anything out of your compost? I am guessing it is about 1/4 of an acre. The most animals we have had share it at once was 4 adult sheep with 3 lambs, 2 adult goats with 2 kids, and about 25 adult chickens with 10 young chickens, plus the LGD. But that was short-term and the most full we had it. 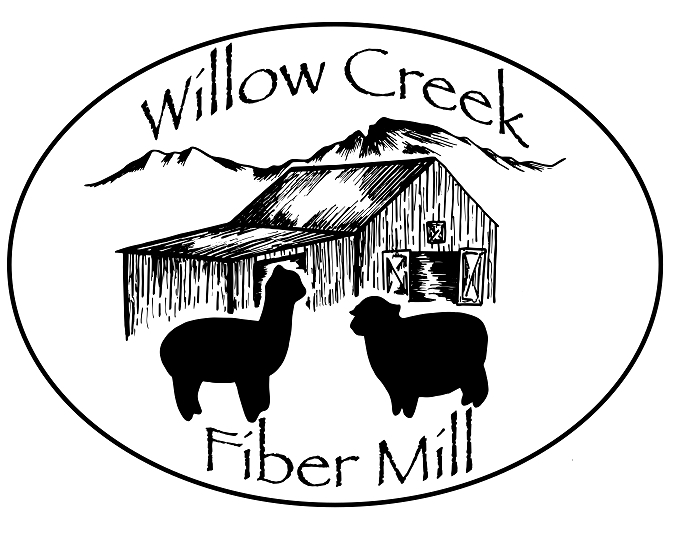 It usually has a mix of about 3-4 adult sheep and goats, 25 chickens, and the LGD year round with an additional 3-4 young sheep and goats and about 10 additional young chickens for about 4 months of the year. We don’t add anything to the compost pile that is not safe for the goats and sheep to eat. And yes, they do enjoy eating off of it when it is stuff they like, such as watermelon rinds – that is their favorite.